M. Night Shyamalan is a friend to paranormal pop culture after The Sixth Sense, Unbreakable and Signs - all spooky, solid outings. Then he seriously tested my patience as an audience member when he delivered the incrementally disappointing films The Village, Lady in the Water and The Happening. And then The Last Airbender was released, based on a popular animated series, which received only an eight percent fresh rating on Rotten Tomatoes. The movie has a lot of vision executed incredibly poorly. In the scheme of things, it probably isn't as odious as some suggest, but it is a failure for the director. Yet I still want to give this guy another chance to make a good movie. Maybe the best hope for him is Devil, a film produced by M. Night based on his idea, but not directed by him. 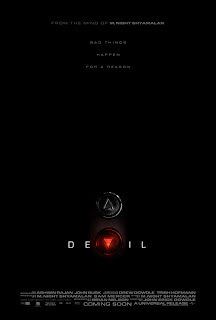 Say what you will about his direction, but Shyamalan has cool ideas so I'm willing to play, ahem, Devil's advocate (and yes, I was itching for that particular bit of cheap wordplay). Not much is known about the film aside from its supernatural themes, but the new trailer (embedded below) suggests it involves strangers tormented by an entity while stuck on an elevator betwixt floors - and worlds? I'm not quite excited for this film yet, but I'm paying attention.